Lest you all start to worry that I have sold my sewing machine to pay for all my new clothes, I have been slowly getting my Sew-jo back. It was temporarily interrupted by selling our home and moving into a much smaller condo. I don’t really have a dedicated sewing space anymore so that has made me reevaluate my sewing methods. But I will not be deterred and I have been slowly but steadily making my flat pattern adjustments to the new Sewaholic Granville shirt pattern. So far, I have done my full bust, forward shoulder, short waist, swayback, and uneven shoulder adjustments. Now all I have left to do is trace and cut the pattern pieces that didn’t have to be altered and make a muslin. I am feeling a little brazen and may forego the actual muslin and cut into a real fabric for this test run. The flat pattern adjustments are looking pretty good when I hold them up against my body in the mirror — ha! I have also solved the dilemma about where to put my sewing machine. If you remember in a prior post, I was debating about what small space sewing solution to use to set up my work area. Well, I didn’t go with any of those options because my grandmother reminded me that I was supposed to take her 1960s Kenmore that is built into a cute little wooden cabinet. I picked up the machine a few weeks ago but knew it wasn’t in working order — I don’t remember my grandmother ever really sewing anything although there are rumors of her sewing prom dresses for my mom and aunt. You can guess how out of shape that machine was! 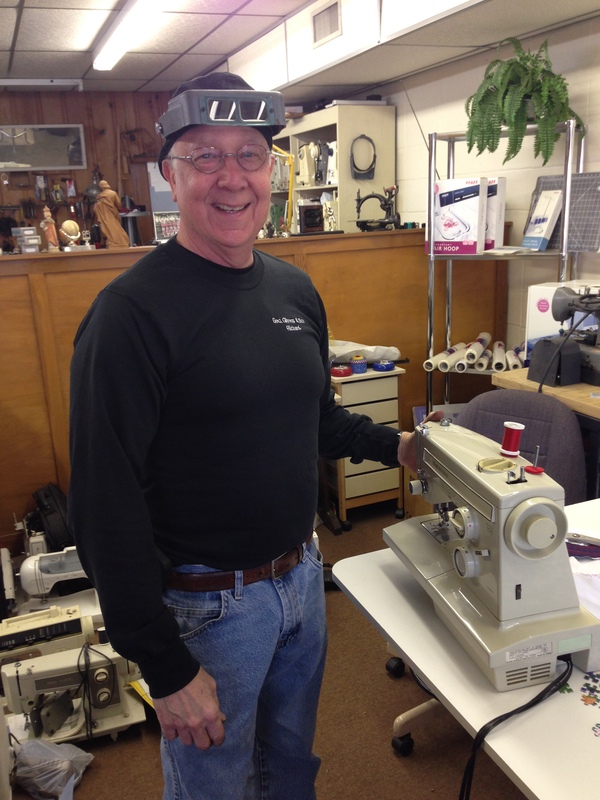 I called my friend and trusty sewing machine doctor, Richard Givens, and he came and picked it up. When I dropped by his shop today, he showed me pictures of all the work he had to do to get her back in serviceable condition — basically a complete overall with the machine torn totally apart. Almost every gear was locked up. But now that he has worked his magic, she is humming a sweet, sweet song, and I can’t wait to sew that Granville on her. Poor little Janome is going to get so jealous when I stash her in the closet for the time being. But she’ll come back out when the new house is finished. Mr. Givens says sewing machines aren’t manufactured like this Kenmore anymore — all precision metal parts, etc. And that if it were to be manufactured today, it would cost over $1000. Luckily the repairs weren’t quite that much but I can understand why many of us today don’t invest in repairing the things we have (as I could have easily bought a decent cheap machine — like my current Janome — for the cost of the repairs). But I would gladly spend it again to be able to sew dresses for myself on the machine that my grandmother and possibly mother once spent hours in front of creating the frocks of their dreams. Here’s a picture of Mr. Givens with my little Kenmore. 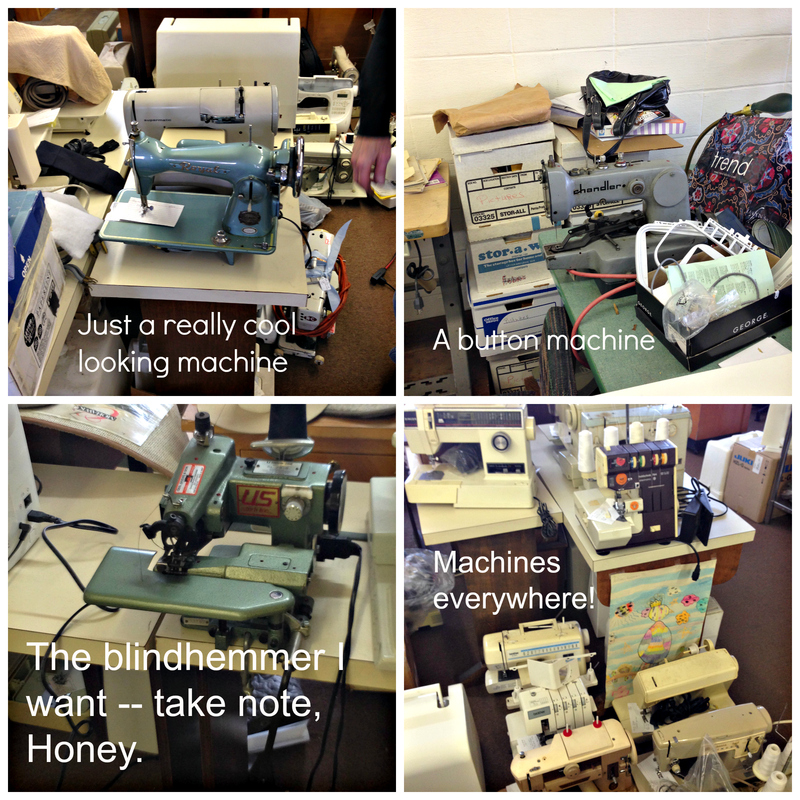 You can start to get a glimpse of all the sewing machines that were laying around everywhere. He let me snap some more pictures to show you all the different types of machines he works on. I don’t think there is a machine he couldn’t fix. The button machine does nothing but sew on buttons. And it does it in about 2 seconds. How awesome is that?!? The last really cool bit of news is that I entered my Butterick 6019 bombshell dress into Gertie’s Grand Giveaway and I was selected as a finalist! Now I have to mail my dress off to NYC to be inspected by the judges — yikes! There is only a 20% chance I will win, but if I do, what will I do with 17 bolts of fabric??? We will have a big giveaway here on the blog! Cross your fingers, say your prayers, and send good thoughts my way!